Renaissance woman and singer/songwriter, Amanda Pascali was born in Queens, New York and is based in Houston, Texas. Amanda's Immigrant American Folk Music showcases her traditional influences, but she is no copy of anyone. As the daughter of an Eastern European refugee with Sicilian heritage, Amanda writes with a sincerity which shows us that home is truly where the heart is. Amanda’s music tells the story of a girl, transplanted from the Corona and Forrest Hills neighborhoods of New York City to the center of Houston, Texas. With a father who was thrown out of his home country for rebelling against the government, Amanda was driven from a young age to be a messenger of her family’s stories and diaspora. Her words tell of her experiences growing up in the light of her family’s compelling memoirs and the grave semblance to the plight of refugees today. In 2016, Amanda recorded a solo, self-titled EP which she released before forming her trio- Amanda Pascali and The Family. The Family consists of seasoned accordion player “Uncle” Felix Lyons, who turned seventy years old on the night of their first show together, and violinist Addison Freeman who is classically trained and experientially tempered to the folk tradition. 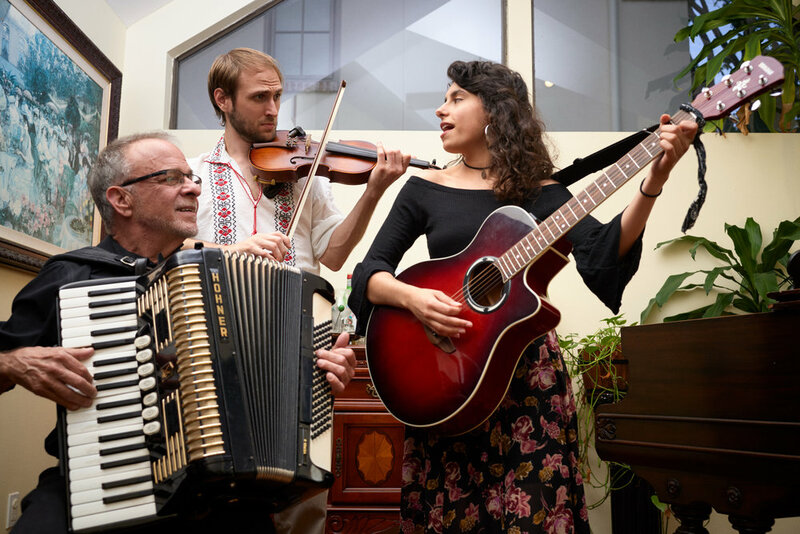 The group formed after all three musicians joined the Houston Balalaika Orchestra, playing traditional Eastern European music in a living room on the south side of town. The trio’s debut, full-length album “Still It Moves” is a tribute to Italian revolutionary Galileo Galilei, and a collection of songs dedicated to all things true, whether or not we want them to be. The Houston Press describes Amanda and The Family as “Houston’s newest artist for you to adore” and “a welcomed addition to the Houston music scene […] with songs that will be stuck with you for days”. Click here to read the up close and personal write up by the Houston Press on the new “Still It Moves” record and the story behind Amanda’s debut, full-length concept album. Read Amanda’s full interview with voyage magazine by clicking here. Amanda and The Family (Addison Freeman and Felix Lyons) at the Houston Italian Festival, 2018. Interview with Antigravity magazine, new orleans. “As a little girl I loved looking at maps. And I had this dream of going on expeditions, and being at sea, and going to the poles.” “…science is about truth and understanding, the same thing that all good art is made about. If the goal is to make science accessible, then art is the perfect medium. In the end, science is art, geology is art.” - Amanda in an interview with Paris Achenbach on the relationship between art and science - Antigravity Magazine, New Orleans, January 2018. Amanda Pascali performing the single "Hey Amorino" off of her new album "Still It Moves". Video filmed and edited by Pat Laughrey as part of the Ambeo Video Sessions.